Hall of Fame jockey John Velazquez reached 5,000 career victories in North America June 14 after going 3-for-3 on the afternoon at Belmont Park, as Jack Shinar reports for ESPN. Velazquez, a 41-year-old native of Puerto Rico, reached the milestone with Galloping Giraffe, his final mount in the sixth race for trainer Todd Pletcher. He is the 28th rider in the U.S. and Canada to hit that plateau. Velazquez’s total does not include one victory in Puerto Rico in 2008. Earlier on the program, Velazquez moved to within one win of 5,000 when he guided San Pablo to an upset victory over Mucho Macho Man in the Criminal Type Stakes for Pletcher. Galloping Giraffe, owned by Repole Stables, won a $65,000 maiden claiming event for 3-year-old fillies going away by eight lengths at odds of 5-2. The one-mile race was moved off the turf to the main track. The daughter of Tapit was timed in 1:36.93. He began riding in the mainland United States in 1990 and won his first NYRA meet title during the 1996 Aqueduct Racetrack spring meet. In total, he has won 26 NYRA meet titles, including five at Saratoga Race Course, where he has won 685 races, trailing only retired Hall of Famer Jerry Bailey (693 wins). Velazquez has been the first call rider for Pletcher for many years. They combined to win the 2005 Travers Stakes with Flower Alley and the 2007 Belmont Stakes with the filly Rags to Riches. The 2007 Belmont Stakes was the first Triple Crown win for Velazquez, who later annexed the 2011 Kentucky Derbywith Animal Kingdom and the 2012 Belmont with Union Rags. 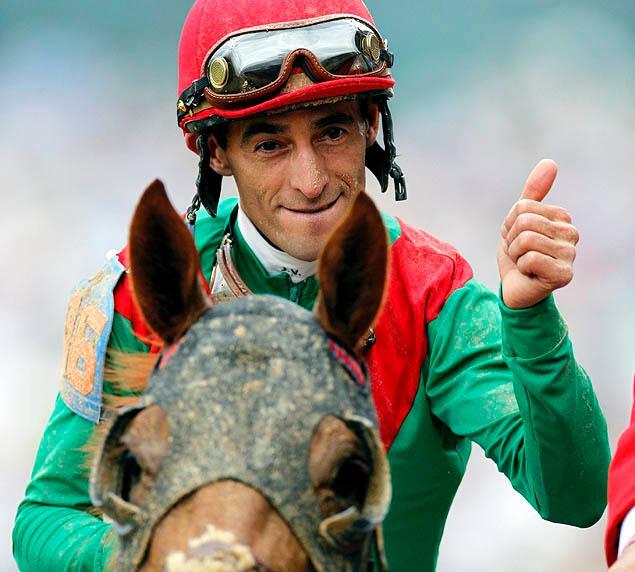 In 2004 and 2005, Velazquez won the Eclipse Award for Outstanding Jockey and in 2009 was honored by his fellow riders with the George Woolf Memorial Jockey Award. He has captured 11 Breeders’ Cup races, most recently the 2012 Mile with reigning Horse of the Year Wise Dan. Velazquez says he hopes he can win 1,000 more.